Dr. Farmer-Dixon treats a patient while on a mission trip in Jamaica. Meharry Medical College's School of Dentistry is training the next generation of tech-savvy healthcare providers while staying true to their mission of outreach. 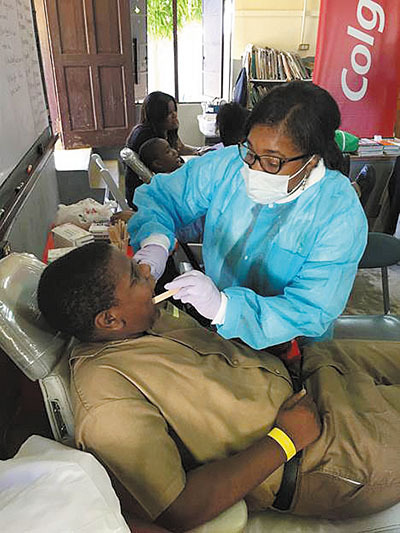 The four-year program boasts nearly 250 students and has graduated 40 percent of all African American dentists in practice nationwide, said Cherae M. Farmer-Dixon, DDS, MSPH, FACD, dean of the School of Dentistry. Farmer-Dixon joined the Meharry faculty in 1992 shortly after graduating from the program. "While the foundation of what we do is still the same, changes in technique and application have been transformational," she said. Part of that transformation includes Meharry's innovative dental simulation center. Provided by Delta Dental of Tennessee, the labs provide students the opportunity to critique their own work and receive immediate computerized feedback. The multimedia teaching system incorporates manikins with computer simulators to provide a reality-based experience. "The simulation labs give them the opportunity to work on patients before actually working on patients," Farmer-Dixon said. Students also receive training on digital health systems, including e-health records and digital x-rays, and create onsite computer generated CEREC crowns. "We know that one day the traditional labs dentists have known will be a thing of the past so we want them to have the experience of doing digital crowns in school," Farmer-Dixon explained. "We want students to learn the same applications they'll need to know to be ready to go into private practice or residency." Another significant milestone for Meharry's School of Dentistry is a noticeable change in demographics. Women now represent approximately half of both faculty and student bodies. And while the school is one of the nation's oldest and largest historically black academic health science centers, the program also boasts a racially diverse student population. The only black female dean among America's 64 dental schools, Farmer-Dixon said Meharry's close-knit community also sets the program apart. "We say we're a family here because we have a strong academic support system which begins when students come to orientation," she said. "We use that as an opportunity to determine strengths and weaknesses and offer early intervention to students who may be at risk or having challenges. We don't just admit you to dental school but work with you to help you graduate and reach goals." Meharry's School of Dentistry joins the University of Tennessee-Memphis as the only two dental schools in the state. More than half of the program's grads continue post-graduate training elsewhere in the nation, while one-fourth will go into dental specialties. Others go straight into residency. Farmer-Dixon said another trend is the number of grads going to work for corporate or group dental offices vs. traditional solo practices. "It's a changing of times and dynamics of managed care, and corporate dentistry has given individuals the opportunity to practice without large loans or overhead," she said. Today's students also possess a better understanding of the correlation between oral and overall health. "The way that healthcare in general is going, people will ask about something like bleeding gums and what that means," Farmer-Dixon said. "It's important for patients to know that more and more studies show correlation between oral and overall health and how it can impact your heart health and systematic disease, and why it's important to receive routine exams and cleaning every year." She said the change in attitude reflects an industry-wide transition into health equity as opposed to strictly healthcare. "It's not just important to know how to treat the disease but how you change the dynamic so you create healthier communities by teaching prevention," she said. "We want to get communities to move from addressing disease to a discussion about good health habits."